Working at Volito Automation is a unique career opportunity in industrial automation. Our basic philosophy is that there are people in the company that makes the business successful. Therefore we purposefully seek and recruit the best Nordic entrepreneurs, employees and partners. Here you will work side by side with the industry’s most experienced project managers and technicians. Your colleagues are ambitious, determined and have high quality. At the same time, we have a culture where there is obviously a long-term perspective, good relationships, short decision paths and high job satisfaction. The working environment throughout the Volito Automation is open and dynamic with almost unlimited opportunities to develop the business, and offer your own position. You work independently with great personal responsibility, you have control over your own time, you meet a lot of people, you work a lot in groups both at home and in the field, and you must continually develop your skills. Are you interested in knowing more about your opportunities within the group, you are welcome to contact us. We believe in bringing people with different experiences and backgrounds. We also encourage you to get in touch with us at the beginning of your career, or still attend the university. Do you have suggestions for new collaborations or are you interested in applying for a job or ask questions about an internship? Please contact Johan Frithiof, +46 73 856 70 61. Interest in the technology has been there since childhood. After completed education Matts Lindqvist chose purposefully hydraulics industry. Today he is one of the industry’s most experienced and has been working for a year at HydX in Stockholm. He describes a living that suits all who like a challenge, variety, freedom, team spirit – and to constantly learn new things. – I started early with hydraulics at the age of twelve, as the sidekick in my father’s company, says Matts Lindqvist. We serviced equipment such as mobile cranes, trucks and loaders. Then there was the Army Technical School during military service, and after that a two-year mechanical engineering course specializing in hydraulics. Matts is technology and system manager at HydX where he designs solutions for hydraulic applications. Customers are manufacturers of powerful machines used in forest and land, at sea, in ports and in industry. This can include wheel loaders, machines on ships, cargo cranes, trucks or industrial robots. – Hydraulics can be perceived as dry and boring, but that’s not true at all. 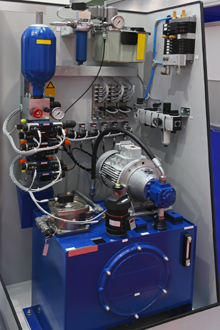 Modern hydraulics is very complex and often should the machines perform advanced operations and functions – under extremely challenging conditions. It interacts with a variety of disciplines such as mechanics, electronics, hydraulics and software. The quality is high and reliability is critical to our customers’ everyday lives. Matts Lindqvist work in teams with the customer’s clients and technicians and fitters at HydX. The group discusses solutions that lead from Matts’ proposal, quotation and design all the way to assembly and testing. Matts works with the design of both technology and control systems and the job involves working with a variety of people – not least in the field. – It is extremely important to know the customer’s customer, says Matts Lindqvist. To go out in the workplace and meet the people who will use the solutions we build. There you will see the challenges it involves, in rain, snow, mud and salt water. You will also get a deeper picture of what the machine operator needs to be able to do. Moreover, it is fun! – Incorporating many people in work is both positive and instructive, says Matts Lindqvist. The more we discuss with various parties, the more experience will come to the surface and can be utilized. If we have an open dialogue, we present arguments both for and against various options. Being able to communicate is a great property so that you really get out all the details that are not visible at first glance. If you have the right background when you come to us, the willingness to cooperate and to learn new things weighs as heavy as extensive experience. HydX is a small, efficient organization. This helps the employees to have a good overview of the business, you know everyone and the atmosphere is familiar. At the same time this makes the work vary because you often have to switch quickly between different solutions to problems, often in multiple projects in parallel. Despite the high tempo, the working environment is calm and pleasant. – It has to do with that we all feel so good, says Matts Lindqvist. And we have an eye on what we do. If you like the eventful days, this is a perfect job. For us it is also a force to be able to offer our customers an overall perspective, not just work at the micro level, but to understand the whole picture. With the movement comes much freedom with the ability to control their own working day. If you want to make your project or thesis with us you are welcome to contact us. Within Volito Automation there are opportunities to do research and schoolwork both in the business as at management and staff level. Our subsidiaries are all focused on industrial automation and obviously we want to get in touch with you studying engineering and automation, but students in areas such as economics, finance, human resources, communications, marketing and leadership are of great interest. We want your work to be more sustainable, both for you as for us, to lead to concrete improvements in our operations and provide skills that are new to the industry. Our employees belong to the industry’s most skilled in their fields. This means that we place high demands on the quality of the work carried out. In return we offer stimulating challenges that give you valuable experience, and you get access to highly qualified mentors. A successful student work involves opportunities for future collaborations, internships or employment, for you who want to know the community closer. We may periodically offer concrete depth tasks but we are also open to discuss your proposal. If you already have an idea for a thesis, or would like to discuss further information, please mail to: CEO Johan Frithiof, johan.frithiof@volitoautomation.se.